At last: Philips invents light switch! What's the worst thing about smart bulbs?Having to get your phone or tablet out, then open the relevant app, to turn them on or off, or turn the brightness up and down. It casts a bit of a downer over yourfuture-facing connected home. For years, customers have cried, "If only there were some sort of 'dimmer switch', perhaps attached to your wall, that could do the job with less hassle. But surely that is too great a dream?" Not any more, friend. Not any more. From September 2015, the Philips Hue wireless dimming kit will let you wirelessly dim your bulbs, without having to touch your mobile device, or use a crapy old, non-smart dimmer switch. Each kit contains a Philips Hue white light bulb and a portable, battery-operated dimmer switch - just screw in your bulb and press the dimmer switch to create "your own personal dimmable glow". 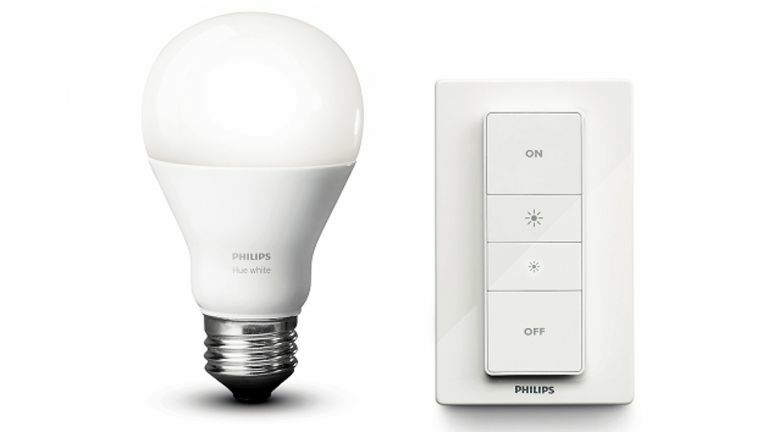 Up to 10 Hue white lights can be controlled at the same time, and the dimmer is backwards compatible with existing Philips Hue-compatible products. The battery means you don't need to wire anything in, but it can be installed in the space used by a standard wall switch. The business end of it can then be removed to work as a remote control, removing the need to stand up to change light levels AND the need to control via your phone or tablet. Clearly aimed at non-techies, the wireless dimming kit solves a problem that LED bulbs apparently have with normal dimmer switches - that they can result in flickering and buzzing when adjusted. The Philips Hue wireless dimming kit will be available from September, priced £30. The personalised lighting system is getting a little Apple Homekit loving in the Autumn.